I haven't posted in a while, so this may be a bit scattered. The Beeston Spring groundbreaking went well. Check out Matt's blog for some photos of the day. Once construction starts I will take some pictures and post the finished product. The groundbreaking was for rebuilding the springhouse roof. The week following I helped do some cost estimates for rebuilding the holding tank and putting in a wash house. We should find out in February if we are successful. We have been enjoying our new place. As Carrie said in the comment to her sea creatures post, I did get stung by a jellyfish on Sunday. Initially I could see where four tentacles struck my bicep and left lines from my shoulder down to my elbow. It felt like stinging nettles but the pain went away much faster. We have seen several jellyfish around the area so it was not a surprise to finally hit one. The water was so murky that I really couldn't see anything. Christmas is in less than a week, but I feel very disconnected from it. There are decorations around the office, but every time I try to listen to Christmas music it just feels wrong. I think the fact that the temperature hasn't varied for the past six months may have something to do with it. It still feels like July here. I'll admit that this posting makes it seem as though I am not a scientist at all. I really need to get a book on marine coastal environments...then I can offer better descriptions than, “oh, that's a pretty fish! Oh wait...maybe it's not a fish...is it alive? Maybe it's a leaf.” That's pretty much how our conversations at the sea sound, but we are quite enthusiastic about it. I do find myself somewhat irrationally afraid of the sea (though note that almost 30% of the creatures that we have seen have the potential to inflict significant pain), so most of my observations are from the shore or a boat. Sorry there are no pictures due to the fact that these are all underwater things. We just returned to our site this afternoon after an interesting overnight trip to Kingston. The original dinner event that was planned was cancelled, so we were able to enjoy the company of the other group 78 volunteers in the hotel for the evening. We also purchased true american pizza for the first time on island. Quite a treat! I would also like to point out that we were able to watch the last game of the World Series thanks to cable at the hotel! Hopefully we will get some more pictures and stories up shortly. I'm optimistic that my internet access is improving...we will see. I had intended to upload and post some pictures to this blog, but for some reason the computer is being snarky and won't let me do it. You can check out a few that I have posted on my Flickr account (link on the right side of the blog). Mostly, I wanted to show people Carrie's hair cut. I did for her in early September ("Can you cut my hair?" "NO!!" "Fine, I'll do it myself. (short break) Now you have to cut my hair." "Fine." "HOW SHORT ARE YOU MAKING THIS???"). Now her hair is shorter than mine (I haven't cut mine since mid-August). We are starting to look for our own place. We have a few leads and hope to move around Thanksgiving. It is time for us to have our own place. More details when we know anything. I haven't been able to watch any of the world series. We don't get Fox (or ABC, NBC, or CBS). I get plenty of college football on ESPN, Big Ten network, and Fox Sports, but I miss all the truly big games. Oh well. Better than nothing at all I guess. Dad asked me the other day if I was starving myself to lose weight (my scale said I lost another 5 pounds). The answer is no. I eat large breakfasts, smallish lunches, and a normal size dinner. I don't snack. I also think my body dropped some weight out of self preservation. When we first got on the island I was sweating profusely for the first, well, technically I still am. I think my body did the same thing sailors on a ship taking on water do, lose any unnecessary baggage. My body has done a pretty good job of that, so now I need to look for other ways to keep cool. I have actually thought to myself that if I took up smoking maybe my circulation would be poor enough that I would feel better. Then I realized that it would probably take a couple of years for this method to actual reach its goal and by then I will be off the island. The negative health benefits definitely do not make that a viable option. I guess sitting in front of fans whenever possible will just have to do. We were on the radio this week. On Wednesday we did a 30 minute radio show on VYBZ FM where we introduced what Peace Corps does, talked a little bit about our projects, and did a short educational section on safe drinking water and personal hygiene. We didn't find out until after the program that the radio station is streamed over the internet. On Sunday we are doing a short introduction of the Peace Corps on the other local radio station, LYNX FM. I looked online and didn't find a webpage. I don't have much to say because not much has been happening, but at the same time we haven't posted in a while so I guess this is mostly to say we are still here. This week things have been very slow mostly because of rain. One of the odd things about Jamaica as a tropical country is that the people here do not like to go out in the rain. That has become very clear this week when many parts of the island have received about 2 inches a day for the past three or four days. Some areas (Kingston in particular) are experiencing some bad flooding. Nothing too bad here, although on my way into work there was about 1/4 mile of road where there was quite a bit of water over the road. The view from the veranda of our host families' house provides a great view of the sea and the sky to the south. Therefore, Scott and I hurry outside to watch storms approach and pass from the veranda-- a pastime that we both are familiar with from our childhoods. I should mention that this is not a pastime for Jamaicans. When it storms here, people immediately seek shelter. Granted, if you don't follow that advice you are likely to get soaked to the bone in a matter of seconds if you are caught when the rain begins. 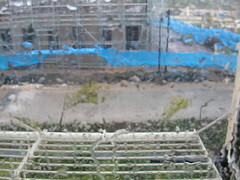 Regardless, the veranda is covered, so it is not a matter of getting wet. 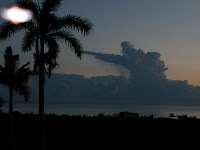 This picture was taken of a storm well to the south of the island. On an unrelated note, I have noticed that buses and classrooms seem to fill according to the same philosophy. If there are zero to very few people seated on a bus that is waiting to depart, no one else wants to get on that bus. However, once a critical load (probably about 75% capacity) has accumulated in a bus it fills very quickly indeed. This normally is not a problem unless there are several empty buses to choose from. Then the time it takes to reach the critical load is quite long and only made worse by the bus drivers' and dokta's (conductor) attempt to reach critical load before any other bus in the vicinity-- by aggressively recruiting the few people intending to travel that direction and very efficiently ensuring that they are evenly distributed amongst the empty buses. Perhaps the goal is not to fill up your bus first, but rather to make sure that no one else can fill up theirs. It also seems to apply that if there are zero to very few people in a classroom, it is also not desirable to stay in that classroom even if the person is precisely on time for the class to start. This means that even the people who are arriving late can make the same argument. I have yet to figure out how to keep people in an empty classroom in order to reach critical load. As long as there are no other empty classrooms in the vicinity to fill, maybe I should hire a dokta. Before I joined the Peace Corps, anytime I wanted to know what I weighed I stepped on a scale. 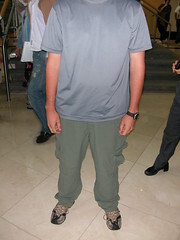 To get a sense of actual weight loss I would weigh myself at the same time everyday wearing the same clothes. I have found this not to be the case in Jamaica. We don't have a scale so weighing myself at home is out of the question. This makes it a little bit hard because I used to weigh myself first thing in the morning. There are weights a the health center where I work. Again, a little difficult because I used to weigh myself with nothing on. I feel if I tried that I would no longer be in the Peace Corps. Also, the scales at the health center tell me I weigh somewhere between 150 and 225 pounds depending on which one I step on. Okay, now I don't know what I weigh. I feel like my clothes are loser though. Oh yes. When you don't own a dryer none of your clothes shrink. In addition, when washing by hand you wring everything out, which stretches the clothes. All of my undershirts look like they are two sizes too big for me (which they now are). I am pretty sure I have lost about 10 pounds since I have been in Jamaica. I gather this by looking at approximate weights on the health center scales. I am pretty sure it was more, but then I came Hurricane Dean and the week of buffet meals and no exercise. During the hurricane I was told that I looked emaciated, which is something I have never heard before when referring to me. I think the closest to that previously was, "If you didn't eat so much some of the emaciated people could get a little bit." Wednesday was Scott's 28th birthday. Happy day to him! It was a mostly uneventful day as far as celebration is concerned because we had a community peer councilor all-day session scheduled that we were helping to facilitate. 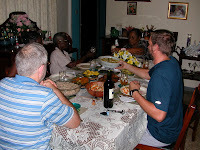 But our host mother put together a very nice dinner for him and we enjoyed a long, comfortable dinner complete with wine and banana cake with ice cream for dessert. We celebrated a little bit last weekend in MoBay with a few other volunteers with the other half of the banana cake and a wonderful lasagna dinner (thanks, A'Nova!). Funny how so much of the celebration revolves around food. How wonderful!! Dogs in Jamaica have a different function than dogs in the states. They are used primarily as guard dogs and are very rarely considered pets. As a result most just sit in the yard and wait for someone to walk by so they can bark at them. To fill the time they breed. None of the dogs here are fixed, which led me to have the odd observation that I have never seen teets on a dog before I came here. There are a few dogs that will approach and not mind human contact. Most dogs keep their distance and try to avoid being kicked. The dogs that do approach will occasionally enjoy a little scratch behind the ears. If the dog is male he usually gets very "excited" and is "tickled pink". It takes about 2 seconds before he is trying to hump your leg. You have to be careful about what dogs you pet around here. Things are progressing slowly. Last week was a busy week for me. I had something going on every night and spent most days preparing for meetings and presentations. There was only one day I spent trying to fill the time. I also kicked off my project with meetings on Wednesday morning and Friday night. The rest of the week was spent helping with a HIV/STI peer councilor training. This week is slow again. I was hoping to have a meeting today for my project that would hopefully lead to more community water quality education, but that meeting has been put off until next Wednesday. I don't think my project will really get going for a couple months yet. I am trying to fill my time by asking other people in the department if I can tag along on meat inspections and such and that is giving me some stuff to do. In the next month I will also hopefully start helping out the three parishes near the one where my primary projects are. "Soon Come" as they say in Jamaica. Some days I envy the teachers who have a class show up every day and they have something to teach. On the other hand I appreciate my freedom to look for other things to work on. It is just taking me a while to get to know the department and see how I can help outside of my project. The Jamaican public transportation system is quite effective. A lot of people don't have cars, so public rides are the way to get from place to place. It's also quite easy-- we just walk down our road to the main highway in the area and wait. When the bus comes that we want, it stops right there for us. There are an infinite number of bus stops in Jamaica. The taxis and buses are heavily used vehicles. I caught a glimpse of one of the odometers for a taxi- ~500,000 km- and it was one of the newer looking taxis, though that was perhaps due to the flashy paint job and high decibel sound system. The buses, a modified 15-passenger van of sorts, are run every day of the week and take a beating from the number of passengers and the constant back and forth on the roads. I did notice one button in the bus I took the other day that was in pristine condition. It was next to the heavily used sun visors and driver/passenger reading lights, which were now bare bulbs. The button read, "moon roof" and obviously had never been touched. This made sense given that there was clearly no moon roof in this bus. The big news from last week: WE ARE NOW VOLUNTEERS!! No more trainees, no more volunteers-in-training (our title from last week). We are officially volunteers. With that we can now stay out after dark and travel around the island. We also got our guitar but we are still waiting on our violin. In addition to that wonderful week, when we got back to our site our satellite was working again just in time for college football (it was down the whole month of August). The hurricane was interesting. We stayed in the US Embassy. The embassy made all of us be there including any Peace Corps staff that is American, and then pretty much begrudged our being there. They didn't give us any supplies at all. All of our food came from Peace Corps staff that ran out to the store before we were stuck there, so we had canned goods and oatmeal for the two days we were there (which really I enjoyed. It made it feel more like camping). The building was kept cold, somewhere in the 60-70 degree range and the building is so high tech and computer operated that they can't turn it off. They also can't (or won't) turn the lights off. That made the first night really short as none of us had packed for being that cold. The second night the Peace Corps got some blankets in and we were sharing so more people could sleep (there were three people under our blanket). That was a much better night. The time was spent reading, watching movies on computers, and playing games. There are marines stationed at the embassy for protection and they took pity on us and brought us puzzles and games. It was a nice opportunity to get to know the volunteers from the previous two years. It was also a great opportunity to watch a hurricane. The embassy was just finished in the past year and is designed for a pretty intense attack. We couldn't hear the wind inside even though it was blowing 115 mph. Unfortunately, the only pictures I could take were through the windows and they didn't turn out too great. The Monday after the hurricane we had a quick swearing in. Apparently the ambassador was called out and wouldn't be around on Friday when we were scheduled to swear in. It also gave the other volunteers a chance to watch the swearing in. It was interesting being in front of the Ambassador in jeans and a t-shirt to be sworn in to Peace Corps. At this point we were considered volunteers-in-training as we had not completed our final testing. On Friday we had a formal ceremony for the Peace Corps staff that wasn't in the embassy and we became true volunteers. Monday afternoon we moved from the embassy to the Pegasus Hotel which most people said was the nicest hotel in Kingston. That may be true, but Tuesday morning it was also the smokiest as one of the generators malfunctioned and started on fire. Damage was limited to the lobby but smoke was thick throughout the first 3-5 floors and several people had a hard time finding their way out. Three Peace Corps volunteers were sent to the hospital for smoke inhalation. We were at the mall during the fire and our room was on the 11th floor so none of our stuff got smoke damage. Several people were on the 3-5 floor and their clothes had a distinct odor of smoke. We spent 8 hours in a conference room at a hotel next door before being moved to a new hotel. That made it 4 days in a row of being confined to a building. Most of us were getting stir crazy. Wednesday and Thursday were testing days with some free time to go out and do stuff. We spent one afternoon wandering around a mall like area. We went to a music shop and were looking at music when the owner started talking to us. She asked us if we were interested in teaching guitar, violin, and music in general in Jamaica. We said once we learned the instruments better we would be. She gave us guitar music books, recorders, and told Carrie that if she wanted to teach violin she had some student violins that she would give her. She just wanted to spread music through Jamaica. It was a very nice experience to have. On Saturday we came back to our sites. There was very limited damage in Westmoreland Parish where we are located. It seems that the worst damage are new potholes in the road. There were some areas that were hit very hard including several areas with Peace Corps volunteers. We were very lucky to come back to an area that had power and water. The island was very lucky that the storm stayed south. The damage could have been a lot worse. Many people are complaining that they prepared so much for such a weak hurricane. Hopefully this doesn't make people complacent the next time because you never know which one will hit the island directly. As most people know, Hurricane Dean is in the Caribbean and heading for Jamaica. The reaction on the news is very different than in the states, but the reaction of the people is similar. The news has a 10 second blurb on it saying that it is coming and may be here Sunday. No windspeed forcasts,no warnings to prepare, just a note that by the way, your weekend may be interrupted by a hurricane. I am guessing some places have a middle ground between the doomsday US news on natural disasters and the Jamaican news cast. On the other hand the people have the same attitude that I saw in New Orleans (granted this was pre-Katrina). "Hurricanes that start in that part of the Atlantic never hit us, they always turn at the last minute." No one seems really worried and I doubt anyone will do anything to prepare until the last minute when they realize that it won't turn. Since nothing is showing a projected track, I am guessing most people don't know that it will probably go right over the country or give it a glancing blow north or south. Chances are slim it will shift and pass us by. We were scheduled to go to Kingston on Monday for our last week of training and swearing in as volunteers. Now we are leaving on Saturday morning and will spend the weekend hanging out in a hotel with the rest of the trainees. I will let you all know how things go. An interesting aspect of our jobs is that if the hurricane does a lot of damage we may be pulled away and do recovery work. The past week of training has been good. It was by far the most productive and I am looking forward to the end of the elections (August 27) and training so I can get started on my projects. Most days I sit and think that I should blog more. Then I remember what I did for the past week and realize that it would be pointless for me to actually put that on the internet. For those interested in what we do, we are in training. Our travel is restricted, we can't really go any where on the weekend, and during the week we are supposed to be at work. I don't think people really want to know that today I am sitting at work learning how to be patient as I become immersed in the Jamaican culture. Work here progresses at a much slower pace than in the US, and rain will bring pretty much everything to a screeching halt (interesting in a tropical country where it rains everyday during the rainy season). In two weeks we will swear in as volunteers. When that happens we will be able to begin work on our project and travel on the weekends. Hopefully that will lead to some better stories about Jamaica. Right now I go to work and then come home. WWHHEEEE!! It really isn't that bad. Mostly right now I have no independence and the people I will be working with on my project are in the field a lot so some days I am mostly waiting for them to come back to the office. Once I am able to actually start on my project and I gain some independence then I will be able to do some of the things I want to do. At this point I am not sure exactly what communities I will be working with, but I know they will be up in the mountains. Once I know exactly where (hopefully next week), I will be able to figure out how to travel to those communities and then I can spend time there getting to know the people. Until then, it is reading Peace Corps manuals. No matter where you are, you can identify a celebration no matter where you are. The telltale signs are the same the world over: music, food, dance, and a large number of people. Dancing isn't always required and never does everyone participate, but when all of these factors are there is is a celebration. When only two items are involved you probably stumbled upon a party. You may not want to know what you are eating, understand what you are hearing, or able to communicate with any of the people, but you know that you should be having fun. When you are a Peace Corps Trainee, they take away the food and the large number of people (I'm pretty sure it is a cost savings measure), put it at the beginning of a day of training, don't give you the holiday off, and tell you it is a celebration. That being said, it was still fun. Early August is a good time to be in Jamaica. August 1 is Emancipation Day and August 6 is Independence Day. To celebrate (and use it as a devious ploy to teach us about Jamaican history and culture), we celebrated Emancipendence Day on August 1. Our festivities only included the music and dance (along with a very nice play in the middle). I volunteered to sing and then was told that to sing I also had to dance. Carrie joined me in the song/dance troop and we did enjoy ourselves as we learned some Jamaican dances and songs. Some people took pictures and when I get some I will post them. Luckily I don't think anyone has any video or audio. Everyone has their little things that get them through the day. In my case, it has been the days. We have been at our sites for two weeks now, and it is taking time to get used to the new setting and the pace of life. We all need those little things to make us feel comfortable and relaxed. For most of the last two weeks for me it was books. I have read three and my supplies are dwindling. That is when I discovered the satellite dish. Carrie has been less than enthusiastic unless I am watching some movie she may be interested in. I have been using this as a means of teaching our host family baseball. They seem to enjoy my switching to a game to check the score during the commercial break on their shows. We are back in Kingston for another week of training here. It is nice to get together and swap stories with other trainees. Our situation seems to be pretty good. Our host family has a wonderful selection of fruit trees in their yard. We took a tour of them the other day and would like to share it with you all. Just keep in mind that while you get to learn about them, we enjoy fresh fruit at least twice a day. Huzzah! Ackee: This fruit is poisonous unless allowed to open on the tree. The fruits are yellow in color and quite creamy when cooked. They are not sweet and I don't really agree with the scrambled egg comparison that they often get. But when cooked with saltfish, onions, and spices for breakfast they are quite tasty. The Jamaicans knew what they were doing when choosing their national dish. June Plum: Next to gneps (there are no gnep trees in the yard), I think June Plums are our favorite new fruit. Tasty both when ripe and when slightly green. Gneps are wonderful, by the way, and remind me of eating a peeled green grape. Sweet Sop: There is also a sour sop, but we did not show the picture here. Almost everyone who tries this at first taste does not like it, but after a few morsels I think it grows on you. The fruit comes apart in small sections that you can see from the outside of the fruit- those little nubs. Each section has a black pit that must be spit out. Pimento (aka Allspice): A wonderful tree! The crushed leaves and the berries smell of allspice. The ones in the picture are close to being ripe. When ripened they are harvested, dried and used whole to season a number of Jamaican dishes. Guava: There are no fruits on this guava tree, but I know some of you will appreciate this kind of guava instead of the one you are most accustomed to working with. Breadfruit: Our first encounter with breadfruit was not remarkable, but it is often served roasted at our host home. This gives the starchy flesh a nice smokey flavor with some incorporated sweetness and a light, spongy texture. I really like it. It can also be served steamed, boiled or fried. In addition to learning about the fruit trees in our yards, we are meeting our communities and traveling to some other areas. We went to Negril for a PC meeting last Saturday and part of the meeting was conducted while we were treading water off the coast of the west-end cliffs. Wonderful! But really, we are working and enjoying getting to know the area that we will call home for the next two years. ...Westmoreland parish! We will be in the far west of the island, near the town of Savanna la Mar which is about an hour from both Negril and Montego Bay. We don't know a lot more about it right now, but we head there tomorrow to continue our training. After almost 10 days we were finally able to travel outside of Kingston, and it was wonderful. All the trainees from the Health Sector went an hour and a half out of Kingston and helped a local community center pave the area in front of the center. It was hard work, but 20 people can get a lot of work done in just a couple hours. The process was different from any cement work I had seen before. It started by moving enough fist sized rocks to cover the area and provide a base. The rocks were found by looking around the building and were all moved in buckets and laid by hand. Then several hundred pounds of sand and gravel were piled up and mixed by hand with four bags of cement. I had never done it all by hand before. It was good to see and help with the process. We finished up the day by going into Morant Bay and visiting one of the current Volunteers who is stationed there. He is a sanitation engineer and showed us a couple projects he has done. It felt so good to get off campus. Today is my brother's wedding. It was a disappointment to have to miss the wedding to be here in Jamaica and we really wish we were there. We are thinking of everyone who is there. Today was our first trip off the campus we are staying on into Kingston. We were divided into groups and given a guide to show us around. Our first attempt at public transportation and the markets. An eye opening experience. We did get cell phones our first day in Jamaica. They are all pay as you go here. Also of interest, you can dial the US by simply dialing 1-area code-number. It is the same to dial Jamaica. It is charged as an international call though. If you are interested in my phone number, send me an email. This afternoon was our first significant free time since we arrived in Jamaica. There was a nice breeze, a cricket match on the pitch, and there was time to enjoy the day and relish in the fact that we are actually here. Our location right now is beautiful and mountains surround the campus. During the long days of training it's important to remember to take in the view while we are bustling around. There is promise of a trip or two off campus this weekend, which will be the next step in our acclimation. PC is doing a pretty impressive and subtle job of introducing us to the culture, food, and environment. Each meal seems to get a little more spicy. All the food is wonderful, especially callaloo, which is kind of a cross between collard greens, spinach and celery and is served up spicy for breakfast. We had a sampling of various Jamaican fruits and goodies the other day. It's amazing what a tasty treat fresh tropical fruit makes on a hot afternoon. The bananas just taste a little more like bananas, the pineapple is so sweet and good, and the mangoes are unbelievable. The weather has been good. The highs are 92-94 with humidity, but there is always a nice breeze, and sometimes a good wind, to cool everything down. The lows are in the mid 80's, but it feels cooler than that which makes sleeping comfortable. Many other PCTs have blogs and we will try to set up links to those pages soon. A lot of people here have been taking pictures already and have posted them. We haven't got around to that just yet. We are now in Miami at pre-service training. We arrived late last night and started this afternoon at 1. Not bad so far. Training was interactive, which helps and we have met some pretty neat people. Lots of interesting backgrounds. We are both excited about the next two years. Tomorrow is our last full day in the states, then Tuesday we check out at 5:30 am to fly to Jamaica. Posts should be more interesting once we get there. It is starting to be more final as we have less than 36 hours left in the states. We are now in Montana completing our final preparations for departing for Jamaica. We arrived June 19 after a very nice trip across the country during which we were able to see quite a bit of family. We are now down to three days before we leave for staging in Miami. We aren't stressed yet, but we feel like we should be. We haven't spent much time packing or sorting our stuff yet and we are starting to run short on time. We have had time to paint my parents new deck, play some golf, play cards, and spend time with family. Not much else to say. We are both looking forward to our adventure. Hopefully the posts will be more exciting once we actually leave the country. The trip has started. We are packed up and out of Philadelphia. The first two weeks of June have been interesting as we sorted, packed, got our lives in order, etc. Especially the last week ("Where do you want this to go?" "I don't give a #$^. Put it in a $*&%@& box" or "Why are you keeping that?") We both got a little short with each other in the last couple of days. We did have a lot of help from friends (thanks Nicole and Andy) and family (Daimon helped us with the final cleaning of the apartment) and that made a huge difference. We were able to get out around 9:30 Thursday morning and got into Clinton, Indiana around 11:30. Friday afternoon we drove up to Crystal Lake, IL and spent some time with Carrie's folks. Tomorrow we are heading out for Montana with a stop in Rockford, IL and spending a night in Minneapolis. Then off to Billings before the farm. We are looking forward to finishing up the driving as we have two vehicles (1 Uhaul truck and the civic). The gas milage has been interesting (10.5 in the truck, 57-60 in the civic). And it's tough not being able to talk much. Not much new to report on the Peace Corps. We have made our reservations finally. We depart Montana on June 30 for Miami and leave Miami July 3 for Jamaica. Other than that, we will find out more in Miami. We have our plane tickets to Miami for staging, flying out on June 30th from Great Falls, MT. Somehow I feel a little bit better about quitting jobs, ending lease, etc. now that we have our tickets in hand. If only we had reassurances that our passports aren't delayed in the current passport debacle. I've had mixed feelings during most of the packing and closing up we have done over the past two weeks. There was a somewhat appropriate commentary on NPR's All Things Considered as I was driving home from work during my last week there. Granted, I'm not in my mid-40s with a family during these times of change, but it's still all about taking risks and just not knowing how it will turn out. I find it to be a wonderfully liberating experience, even though it is partially filled with trepidation and uncertainty. Geez. If this is what I'm talking about during moving from PA to MT, just wait until you see what comes out once we get to Jamaica. Chosing a name for the blog is more difficult that one would think, primarily because all the good names are taken (including allthegoodnamesaretaken.blogspot.com and nogoodnamesleft.blogspot.com). In the end, we ended up going less original than we had hoped for. Planning has begun. We have started to purge our possesions, which is odd because then we go out and buy more (I haven't bought clothes in around 5 years, so I needed to upgrade some of my wardrobe for Peace Corps service). We have sent in a letter to terminate our lease the middle of June and we each have less than 2 weeks of work left. Too bad there is so much to do before we go. It will be hard to enjoy all of it. As we prepare to depart the states, we have at least taken the time to set up this blog to keep in touch with family and friends. Check back once in a while and see what we're up to.